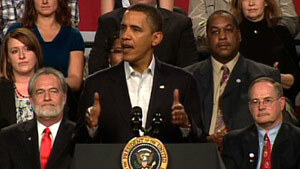 President Obama speaks about health care Friday at a community college in Ohio. He cites lobbyists, "partisan politics aimed at exploiting fears"
Elyria, Ohio (CNN) -- President Obama admitted Friday that he has run into a "buzz saw" in the yearlong health care debate. The president, in remarks delivered at a community college, accentuated his recent populist tone, promising to continue fighting for health care legislation and other domestic priorities. "Here's the good news: We've gotten pretty far down the road. But I've got to admit we've had a little bit of a buzz saw this week," Obama said at Lorain County Community College near Cleveland, Ohio. "You are running headlong into special interests and armies of lobbyists and partisan politics that's aimed at exploiting fears instead of getting things done," he said. "And then you've got ads that are scaring the bejeezus out of everybody. And the longer it takes, the uglier it looks. "So I understand why people would say, 'Boy, this is -- I'm not so sure about this.' Even though they know that what they've got isn't working." Obama acknowledged the political disruption caused by Massachusetts GOP state Sen. Scott Brown's upset win Tuesday to fill Ted Kennedy's U.S. Senate seat. Brown's win stripped Democrats of their 60-vote Senate supermajority, giving Republicans enough votes to block key parts of Obama's legislative agenda. "I understand why after the Massachusetts election people in Washington were all in a tizzy trying to figure out what this means for health reform, Republicans and Democrats -- What does it mean for Obama? Is he weakened? Oh, how is he going to survive this? That's what they do," he said. "I want you to understand -- this is not about me. This is not about me. This is about you." He said he didn't take up health care reform to score political points. "Believe me, if I were (trying to do that), I would have picked something a lot easier than this," he said.